Fairfax Financial is a property casualty company based in Canada. It is led by an owner operator, Prem Watsa, who started the business in 1985. It is one of my first investments and it had been a major contributor to my portfolio around the time of the financial crisis. I had sold it in 2011 to deploy cash into beaten down financials. Now that many of these financials have rallied, I have reduced my allocation to them and wanted to take a fresh look at Fairfax. An insurance company should be evaluated based on their underwriting and investing skills. There are a few insurers that are good at underwriting but it is rare to find insurers that are good at investing. Fairfax is that rare combination of an insurer that seems to do an acceptable job at underwriting and absolutely amazing job on the investment side. They have demonstrated repeatedly an ability to protect shareholders from adverse market conditions and to profit from market dislocations. The results of Fairfax Financial are going to the determined in large part by what the company earns on its investments. Hence, a critical part of valuation is estimating the company’s expected returns on its investment. So we need to analyze the drivers of past returns to get a sense of what returns can be expected in future given current bond and stock market valuation levels. Fairfax breaks out the 15 year returns of its stock and bond portfolios and compares them to benchmarks. The above clearly demonstrates the outstanding investment results generated by Fairfax. However, we need to look at the entire investment portfolio since a significant part of the portfolio is invested in cash and short term investments and there are changes to allocation between stocks and bonds. By looking at total portfolio we incorporate the effect of market timing moves made by Fairfax. 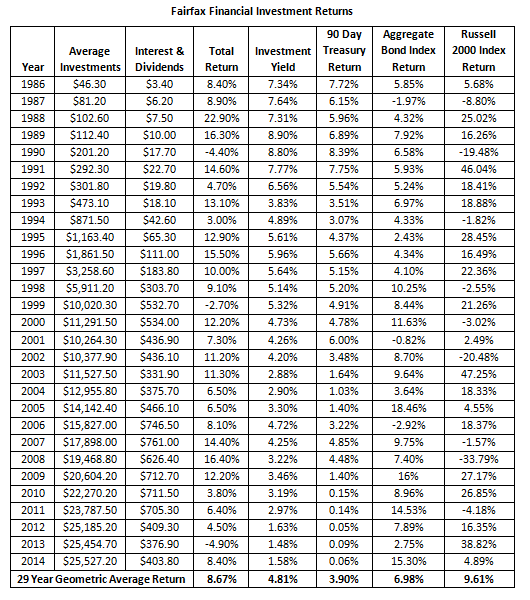 In the table below I have used the aggregate bond index and Russell 2000 index to analyze the returns generated by the total investment portfolio. These are more appropriate benchmarks given the type of investments Fairfax actually makes. Note: Fairfax Financial 2014 annual report, shows the 29 year return as 8.9% which is a simple average of all the years returns. An investor with a multi-year investment horizon would actually get a geometric average return and is thus a more appropriate measure of performance. For example, an investor who makes 20% in one year and loses 20% in the second year, would have a simple average return of 0%, but geometric average annual return of -2% over the two year period. In the first decade, there were very little excess returns, but it is understandable that a deep value investor would have a tough time keeping up in a roaring bull market with no major pullbacks. They did take advantage of the attractive valuations and invested heavily, to the tune of 45% of the portfolio into stocks. In the second decade, Fairfax was very cautious, dramatically reducing the stock allocation to just 13% on average. Fairfax also took advantage of the extreme divergence in valuations of new economy and old economy stocks, with its stock portfolio vastly outperforming the indexes (187% vs. -21% for Russell 2000). Stock selection played a key role in generating excess of 2.54% during this period, with changes to allocation being a drag to their performance. Even after correctly identifying that the market is extremely overvalued, by trying to take advantage of that with changing allocation hurt their performance. The extent of their stock portfolio outperformance, hid the massive opportunity cost of this decision. Over the last nine years, investment returns were lower than the first two decades but with higher excess returns. However, about half the excess returns came from CDS gains during the financial crisis. These could arguably be considered as one-time gains and excluding them, the excess returns are about 1.38%. The use of stock market hedges in recent years seems to be in response to their experience in 1999 – 2003, where they outperformed the market by 210%, but did not get much benefit due to their allocation of only 9% to stocks. Currently, despite their macro concerns, they have a close to normal allocation but with protection from hedges. Since performance is influenced by starting and end points, it would be helpful to use a slightly different timescale. If we look at the performance over the last 15 years (2000 to 2014), Fairfax investment return is 8.17% compared to the equivalent benchmark index performance of 6.66%. Thus Fairfax outperformed the benchmark by 1.51% over the last 15 years. Over the full 29 year period, excess returns were about 1.69%, including CDS gains. The excess returns are 1.25% excluding CDS gains. The outperformance of the entire investment portfolio is thus much more modest than when looking at just the performance of their stock and bond portfolios. Like most good value investors, they generate the most excess returns when markets are very volatile. Portfolio size does not seem to be causing any drag on their investment performance. Their stock selection has been the primary driver of performance while allocation changes based on macro have been a net overall drag. Returns are going to be heavily influenced by yields given their propensity to hold nearly a quarter of the portfolio in cash and at least half of the portfolio in bonds under almost all conditions. It seems reasonable to expect about 1.5% to 2.5% of excess returns over the relevant benchmark portfolio in line with what has been achieved in the past by Fairfax. If cash was to return 1%, bonds 3% and stocks 5% over the next decade, the benchmark portfolio would return about 2.94%. With excess returns of 1.5% to 2.5%, total investment return for Fairfax portfolio would thus range from 4.5% to 5.5%. Expected returns of 4.5% to 5.5% seem very low compared to Fairfax historical track record of 8.7%, but it just reflects the current investment climate of low yields. We can also approach this from a completely different angle. Fairfax had an average investment yield of about 4.8% over its 29 year history. Currently it is less than 1.6% (see Note 1 below). So the dividend yield is 3.2% lower than what Fairfax was getting in the past. In addition, rising valuations which caused lower yields, accounted for about 1% of the return (see Note 2 below) in the bond portfolio. These two factors accounting for about 4.2% of Fairfax portfolio return are not going to reoccur going forward. If Fairfax investment team performs just like it had in the past with the only difference being lower yields, then the investment returns should be about 4.5% (8.7% historical return – 4.2% from lower yield and capital return from falling yields). 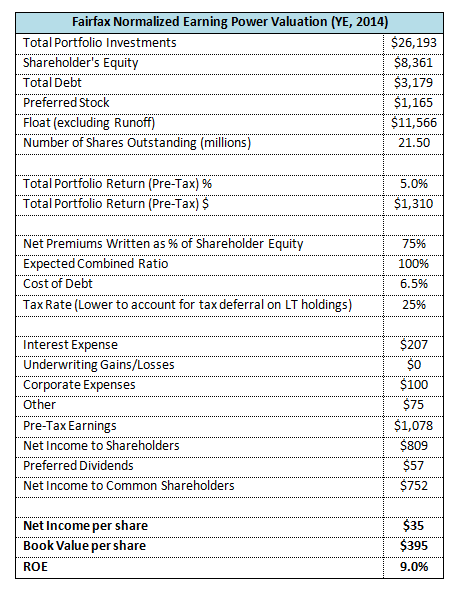 Note 1: Fairfax portfolio yields 2.6% but actual yield is only about 1.6% because its hedges via total return swaps require it to pay dividends on its short book which would reduce the total yield on its portfolio. If hedges were closed, the drag from lower yields would drop by 1% to 3.2% and Fairfax investment portfolio would have expected return of 5.5%. Note 2: We can calculate this by separating out the capital return and income return on the benchmark portfolio each year to estimate the contribution over the full period. Thus, a return of 4.5% to 5.5% is a reasonable expectation from Fairfax investment portfolio over the next several years. This assumes cash returns 1% and bonds returns about 3%, but they currently yield only 0% and 2.5% respectively. Using current rates, an investment return of 4% is more probable in the next couple of years. At an expected investment return of 4% to 5.5%, we can estimate the likely return on equity (ROE) over the next several years or until there is a significant change in market valuations. Using a baseline investment return of 5% and breakeven underwriting, we can estimate the normalized earnings power as below. Fairfax has shown improved underwriting in the last few years and acquisitions have been focused on companies with good underwriting results. Thus, it might be reasonable to expect Fairfax to breakeven in underwriting, even though it historically lost money. Using a few plausible combinations of investment and underwriting results we can come up with a range of earning estimates. Since Fairfax has a small dividend and reinvests most of its earnings, book value growth is going to closely approximate ROE. Optimistic Scenario (Investment Return 5%; Combined Ratio 100%): ROE of about 9%. Conservative Scenario (Investment Return 4%; Combined Ratio 102%): ROE of about 5%. Baseline Scenario (Investment Return 4%; Combined Ratio 100%): ROE of about 7%. Highly Optimistic Scenario (Investment Return 5.5%; Combined Ratio 97%): ROE of about 12%. Thus Fairfax is likely to compound book value anywhere from 5% to 12% over the long term with the lower end of the range being more likely. There are lots of scenarios that could cause book value growth to deviate significantly from above, but this provides a baseline from which to look for deviations. Especially, management target of 15% book value growth requires the deflation thesis to come through or a stock market correction of similar magnitude to the financial crisis to come to pass.